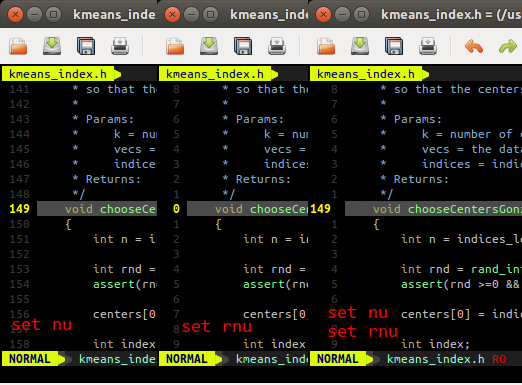 Many movement, yank and delete operations in Vim work on relative line numbers. For example, to delete the next 5 lines the command d5j can be used. To aid such operations, many users prefer to view relative line numbers: the current line is 0 and the lines moving up and down from current line are incrementally numbered. Vim 7.4 adds a hybrid mode for line numbers: the current line shows the absolute line number while the rest show the relative line number. I find this very useful. To turn on hybrid line number, set both the number and relativenumber options. This works great for me on a Linux machine, but it doesn’t work on my Mac with Vim 7.4 installed via Homebrew. Any idea why that might be?